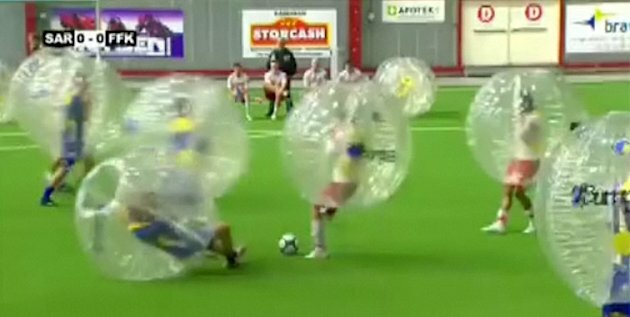 “Bubble Football“: one way to cushion the impact of ‘bumps’. Since Shakespeare‘s day, ‘bump‘ has meant a protuberance, something raised above the normal level. In a road, a bump forces one to slow down. During an election, a bump is more like a bounce. In the late 20th century, as data visualization became more common, words were commandeered to describe meaningful patterns or events. For instance, a significant change in a graphic trend-line (since at least 1980) became a ‘bump’ in the polls. Soccer has good and bad bumps too. Received wisdom says that when a team fires its manager, almost always because of poor results, the team revives, plays better, and often wins its next game, or several games. In other words, the team will enjoy a positive ‘bump’. The general reasoning is that players, wishing to impress the new manager, will try harder to keep their place on the squad, or earn the favor of the new boss. Or that the sheer psychological force of a significant change will spark a team back to life. So we see that teams in the Premiership have changed managers 278 times since 1992 (one estimate says that 195 of these were involuntary). At this time, Arsene Wenger of Arsenal has been at the helm of his club for longer than all other 19 current Premier League managers have served in their current posts combined. Can a team engineer the ‘bump’ it wants to avoid the ones it doesn’t? David Sally and Chris Anderson, in The Numbers Game: Why Everything You Know about Soccer is Wrong (Penguin 2103) have looked at data about the hiring and firing of managers (chapter 11). And they’re convinced that a change doesn’t do what owners and fans think it does. They cite a clever study that compared Dutch Eredivisie teams that had poor runs of form (defined as when “a club’s points per game average declined by 25 percent or more over a four-game stretch,” p. 286). Some teams fired their managers; some did not. Then they looked at results after that bad run. In both cases (whether or not the boss was fired), teams got better or ‘reverted to form’. Sally and Anderson distill the lesson: “clubs simply regress to the mean.” (p.285). Kickdex, looking at the Premier League, has largely confirmed their results. Teams have ups as well as downs, so the same principle applies to good runs of form — they can’t last, unless the team’s “mean” level of play (and probably their talent and payroll) is just very high. Castel Rigone had won five in a row at the start of the new year. They’ve now lost two in a row. It’s part of the wave pattern. Earlier this year, when Castel Rigone fired Di Loreto and hired Fusi, the team won their next two games (though Di Loreto hadn’t been dismissed due to results). On Sunday, Jan. 12, Castel Rigone played Martina Franca, who had just fired their manager the week before after the team had slid down the standings. Lo and behold, Martina Franca won the game 2-0. But was it Martina Franca’s ‘bump’, or Castel Rigone’s ‘dip’? Perhaps a bit of both. Castel Rigone then lost their first home match since Oct. 5 against Aversa Normanna, 1-2. Agostinelli’s strike vs. Aversa Normanna off the bar, and off the line (the white smear is the ball). From LegaPro video highlights, below. During their hot streak, Castel Rigone had been stingy on defense, but in both of their losses they gave up early goals (in the second minute and tenth minute, respectively), due to inattentive central defenders. They also had some bad luck. In the first match, Tranchitella had two goals called back for offside (somewhat questionable, given how far up the field the assistant referee was standing); in the second Agostinelli had a sharp volley hit the crossbar and then bounce off the goal-line, and their new striker Scappini missed a penalty (that’s five the team has missed this season so far — a collectively miserable 50% conversion rate); either would have tied the game. After the game against Aversa Normanna, though disappointed with results, Luca Fusi, the manager, seemed to understand the ups and downs of a long season — not too excited about the five in a row, and not too depressed about the last two. The team is still in fifth place, but its healthy cushion over the mid-table teams has nearly been erased. Roberto Gimmelli, captain and central defender, has admitted the mental focus of the players has been off: “siamo stati poco concentrati” (Giornale dell’Umbria, 21 Gen. 2014, p. 35). The squad will have plenty of time to concentrate on their long trip down to Sicily to play Messina on Sunday. They had better fly down there, because the 10-hour trip by bus on the Autostrada del Sole has plenty of bumps. will this hold true for the Vikings now that they fired their coach and hired one that curses at their players?????? « It’s chess, Jim, but not as we know it.